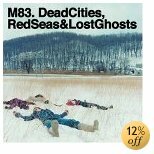 I really dig M83's album Dead Cities, Red Seas & Lost Ghosts...not surprising since I also dig My Bloody Valentine (try Loveless, for a tasty sample of their work, a track of which was featured on the Lost in Translation soundtrack), to whom M83 are often compared. Salon is offering a free download of the M83 single Run With Flowers (right-click to save the MP3). This type of music is often described as "sonic landscapes," which seems appropriate. The various instruments create layers of noise that overlap and interact in oddly melodious waves.